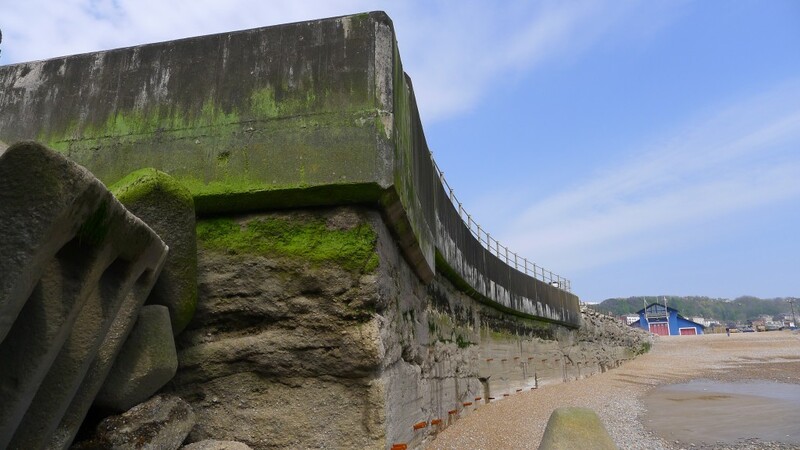 Life Among the Concrete: A Harbour Wall Dérive | Unofficial Britain. The Stade is a shingle beach from where fishermen launch their boats. At low tide the shingle is strung with fish heads and crab claws. 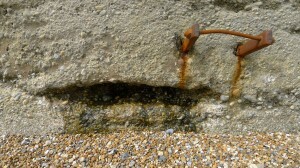 A harbour wall protects the beach. Herring gulls stand sentry as I approach over rocks and an iron bar encrusted in mussels. The wall’s only a couple of hundred metres long. But as I get in close a peculiar world opens up. 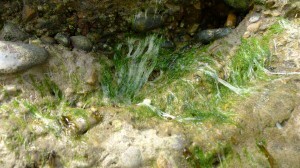 The concrete is a mass of pebbles and shells, coated in a living layer of limpets, hairy weed and green slime. When I look closer the surface crawls with tiny crabs. The closer I look, the bigger the world grows. 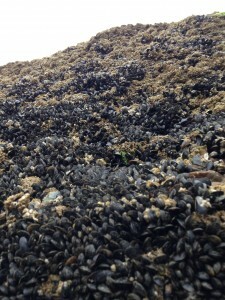 Above me, a forest of miniature mussels points skywards, clasped hands raised in praise. What was once a wall is now a rugged Scottish mountain, in hues of black and green. Shrinking, I pick my way over man-made geometric blocks, shaped like A-s, remnants of an ancient temple, to a section of wall made from larger pebbles. ….Or are these the same pebbles…. and it’s just me getting smaller? Each of these gigantic pebbles is ringed by white pods with blistered tops, like extinct volcanoes. I spot a bulging black ball, the size of a glass eye. I can’t tell whether it’s liquid or solid. The ball is perfectly shiny, flawlessly black, utterly terrifying. I stare at myself in its fish-eye mirror. I can’t get away from it quick enough. After a gap filled with broken blocks, the wall narrows over a rising shingle slope. 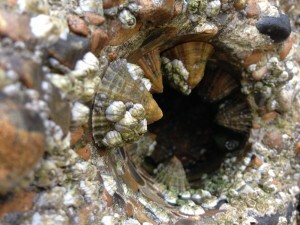 Here are big limpets, connected by streamers of spunky sludge. The horny bastards! These are quite clearly the lords of the overhang. Caught with their pants down when the tide goes out. Lesser beings colonise the cracks below, where sections of wall ram against each other like glaciers. In these slime-havens, gnats cruise and sea slaters scuttle. Ribs of iron jut from the wall at intervals, lurid with rust, growing longer as I proceed, as if they’re being slowly ejected from the flesh of the wall. The concrete is streaked with orange mascara tears. Sea water dribbles constantly from slits. I wonder how much liquid is stored inside this construction. 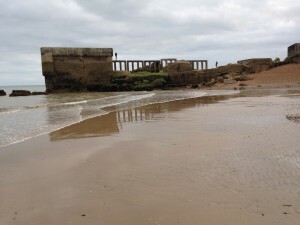 Does the wall empty completely before the tide returns? Or do streams gush permanently through microscopic tunnels? I want to push through a hole to see inside, but my head is big and cumbersome, butting against the stone. And that’s when the wall explodes. The final stretch of wall is a crazy mash-up of pebbles and shells, limpets and mussels, weed and slime, with random metal fragments. 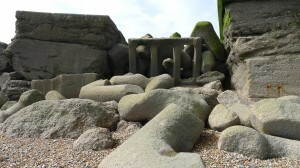 It’s as if the whole Stade – with its workshops, pebbles and boats – erupted and then cooled in a slab of lava concrete. I half expect to see human teeth, spanners and jawbones embedded in the morass. As I think these thoughts, I’m interrupted by a smash of shingle. Pebbles come flying over the rim of the wall, crashing around me. To the left of me, to the right of me – smash! smash! smash! I duck and run from the wall with my arms over my head. When I reach the fishing boats I turn. There’s a line of teenage boys coming along the top of the wall, hurling stones ahead of them, unheeding of anyone below. As they reach the far end, by the collapsed temple fragments, they stand in a line and stare out across the beach – lean giants, watching for girls and rivals. Trouble on the horizon. For a moment I feel empathy with the limpets, so vulnerable in a world that is exposed to air twice a day. A life spent hanging on the edge, waiting for human gods to come, smashing things up, or writing things down. 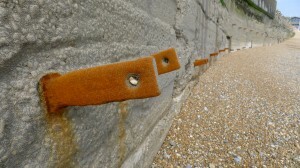 For more Harbour Wall photos, click here.